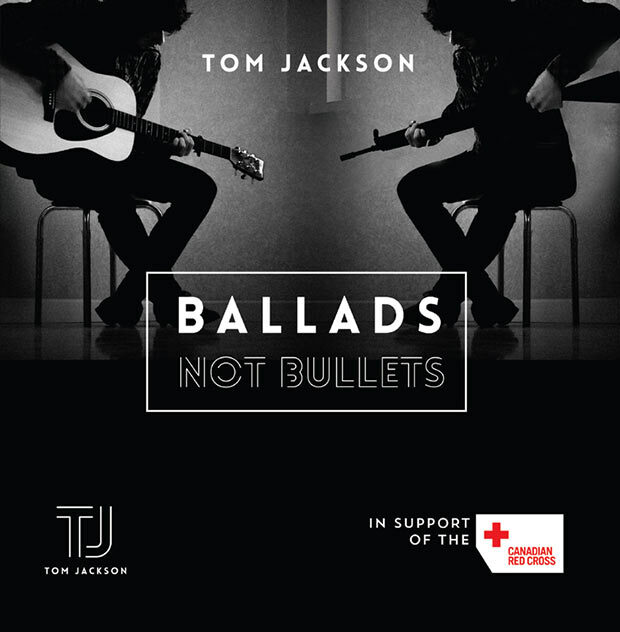 Toronto, ON – October 16, 2015 – Today, actor, singer, and lifetime philanthropist, Tom Jackson releases his new album, Ballads Not Bullets, and announces the details of his annual Huron Carole Tour. Tom brings a new twist to his nationwide tour, The Huron Carole, by presenting galas in a dozen cities across Canada this Christmas. Honouring 28 years of fundraising history, Tom’s varied philanthropic national projects have generated over $200 million in combined cash/in-kind donations for food banks and disaster relief. The 2015 gala tour will begin in St. John’s on November 28 and end in Victoria on December 18 (all dates and local beneficiaries listed below). Presenting sponsor is Great-West Life, London Life and Canada Life. For ten years, Tom and Alison Jackson have been producing gala events for various charities and the time was right to incorporate this model into The Huron Carole tour for 2015. In some Canadian cities, this will mark over 25 years of annual concert performances by Tom in support of food banks. The Gala-style fundraising campaign came to being with Hull Child & Family Services in Calgary. Between 2005 and 2009, $920,000 was raised for this agency. The magic of Tom playing to crowds of 300-400 people set a special tone for those looking to celebrate the Christmas season in exclusive splendor. The Huron Carole is a state-of-the-art, multi-media magical journey featuring enchanting songs of Christmas with a shimmering light of faith and plenty of TomFoolery. At the heart of this classic story is how Christmas literally saved Tom’s life and helped provide hope for millions of needy Canadians for almost three decades. It’s a story of mythical characters in modern times that connect us with the spirit of giving: a cat, a donkey, a little girl, and an old Indian storyteller will share a secret: “having nothing is everything when you have nothing”. Tom Jackson, founder of The Huron Carole Benefit Concert Series, is a musician, beloved TV personality (North of 60, Star Trek, Law and Order), and long-time champion for the marginalized. Having experienced life on the streets himself, he discovered music was his way out – and an opportunity to help others. The Huron Carole is a project of the Christmas & Winter Relief Association whose mandate is to support organizations doing hands-on work with the homeless and hungry in Canada.